A McDonnell Douglas MD-83 passenger plane, 5N-RAM, operated by Dana Air was destroyed when it crashed into a residential area of Lagos, Nigeria. All 147 passengers and six crew members were killed. There were 6 ground fatalities. The airplane was on the fourth flight segment of the day, consisting of two round-trips between Lagos and Abuja. The accident occurred during the return leg of the second trip. The first officer was Pilot Flying. Flight DAN992 initiated engine startup at 14:36, taxied to runway 04 at Abuja Airport and was later airborne at 14:58. Fuel endurance was 3.5 hours. The flight climbed to a cruise altitude of 26,000 ft.
DAN992 made contact with Lagos Area Control Center at 15:18. At the time the captain and first officer were in a discussion of a nonnormal condition regarding the correlation between the engine throttle setting and an engine power indication. However, they did not voice concerns then that the condition would affect the continuation of the flight. The flight crew continued to monitor the condition and became increasingly concerned as the flight transition through the initial descent from cruise altitude at 15:22 and the subsequent approach phase. DAN992 reported passing through 18,100 at 15:30. Shortly afterwards the crew confirmed that there was no throttle response on the left engine and subsequently the Captain took over control as Pilot Flying (PF). The flight was however continued towards Lagos with no declaration of any distress message. With the confirmation of throttle response on the right engine, the engine anti-ice, ignition and bleed-air were all switched off. At 15:32, the crew observed the loss of thrust in engine no. 1. Between 15:37 and 15:41 the flight crew were engaged in pre-landing tasks including deployment of the slats, and extension of the flaps and landing gear. At 15:41:16 the first officer inquired, "both engines coming up?" and the captain replied "negative." The flight crew subsequently discussed and agreed to declare an emergency. At 15:42:10, DANA 992 radioed an emergency distress call indicating "dual engine failure...negative response from throttle." At 15:42:35, the flight crew lowered the flaps further and continued with the approach and discussed landing alternatively on runway 18L. At 15:42:45, the captain reported the runway in sight and instructed the first officer to raise the flaps and 4 seconds later to raise the landing gear. At 15:43:27 hours, the captain informed the first officer "we just lost everything, we lost an engine. I lost both engines". During the next 25 seconds the flight crew was attempting to restart the engines. The airplane did not reach the runway and crashed in a residential area about 9,3 km short of the runway 18R. 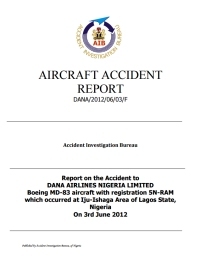 An investigation by AIB Nigeria showed that the captain was employed by Dana Air on 14th March, 2012. He was originally from the United States, but was suspended in 2009 by the United States Federal Aviation Administration (FAA) for some misdemeanours. It was noted that most of the recommendation letters submitted by the captain were also signed. Further, the line trainings that preceded the captain's checkout had a lot of adverse remarks made by the training captain. He started flying as checked out captain on 2nd May, 2012 and had accrued over 120 hours of flight time before the accident. This condition was similar to the no.1 engine of a different Dana Air MD-80, 5N-SAI, that was involved in an incident in October 2013 when the aircraft returned to the departure airport with the engine not responding th throttle movements. This engine also was not in compliance with Service Bulletin SB 6452. This bulletin was issued in 2003 and called for the installation of new secondary fuel manifold assemblies, incorporating tubes fabricated from new material which has a fatigue life that was approximately 2 times greater than the previous tube material. Wind 190 degrees at 7 knots; winds varying between 140 and 230 degrees; Visibility 10+ km; Scatter clouds at 1400 feet; Temperature 30°C, Dew point 23°C; pressure 1013 mb. CAA Nigeria suspended the AOC pending recertification on June 5, 2012. Dana Airlines should ensure that prior to resumption of flights, visual fuel tanks inspection for evidence of fungal growth or contamination followed by biocide treatment be carried out in all operating MD-83 aircraft. The fungicide additives used in the fuel must be approved by aircraft and engine manufacturers. The frequency of treatment and the dilutions prescribed by the aircraft and engine manufacturers must be adhered to. The aircraft maintenance schedule or programme should be amended to include the exercise in accordance with the aircraft and engine manufacturers’ requirement. Dana Airlines should ensure that for all its flight operations with MD-83, a minimum of 2000lbs of fuel must be maintained in the centre fuel tank of the aircraft on landing at any destination, while AIB investigation goes on. Dana Airlines should ensure; (a) Adequate background check is conducted in the employment of foreign airline captains and safety critical employees. Such checks should include review of cases of revocation, withdrawal and suspension of licences by regulatory bodies in the applicant’s current or historical employment records where applicable. (b) Any newly employed foreign captain must fly with a competent senior first officer who is familiar with Nigerian Airspace and routes for at least the first 100 flight hours, to enable the new captain be conversant with the operations of the airlines within Nigerian Airspace. NCAA should; (a) As an essential aspect of its oversight function review CPL/ATPL/issue/renewal/validation forms to include background check with the view to discover cases of revocation, withdrawal or suspension of flight crew licences issued to applicants by any other regulatory authority. (b) Validation of foreign licences should be effected when all confidential details have been received from previous employers and appropriate regulatory authority including satisfactory aero-medical reports and a return of due diligence form/document carried out by the airline. (c) Appropriate declaration should be included in the questionnaire/form to oblige applicants to declare all relevant information as requested. FAA should ensure that Pratt & Whitney considers the following: a) Revise Service Bulletin JT8D 6452 making it mandatory within a given time-frame, thereby upgrading the Compliance Category. b) Re-design the installation and shimming procedures of the manifold assembly to remain foolproof to prevent incorrect installations. Dana Airlines should ensure the following: a) Any remarks or deviations from Company Standard Procedures noted by the Training Captain on the Trainee during Line Training must be addressed before final checkout as a Line Captain. b) All training procedures must be in compliance with approved Company Operations Manual, SOPs and Nig. CARs. NAMA Quality Assurance Management (QAM) should ensure that all Air Traffic Controllers strictly adhere to the ethics of their profession, which is, providing assistance to flight crewmembers in emergency/critical situations. Distance from Abuja International Airport to Lagos-Murtala Muhammed International Airport as the crow flies is 509 km (318 miles).